Review the pictures and facts learned about ships. 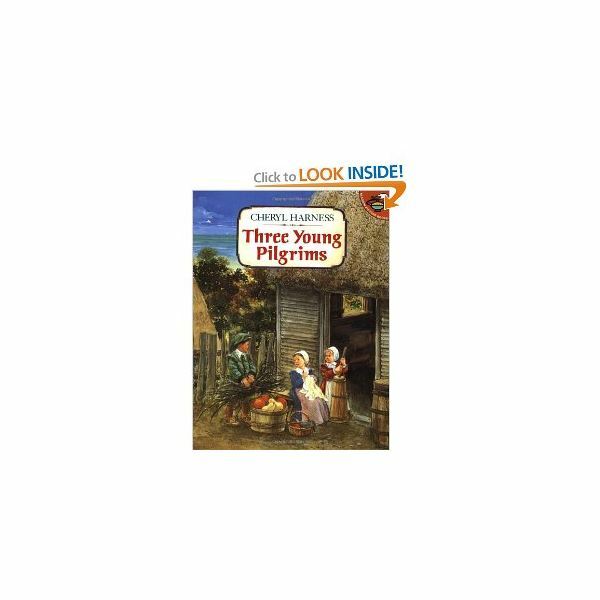 Read the book, Three Young Pilgrims by, Cheryl Harness. The book is very long, so it should be divided between two lessons. Read the story in Circle Time until you reach the middle section of the book (this is the part in which the Pilgrims meet Samset). Discuss the events that have taken place in the first section of the book. Fold the white piece of large construction paper in half and cut out a "u" shape in the middle of the fold. This will create the hole for the neckline. Open the folded collar and cut the middle of the "back" of the collar to allow for an opening. To make it easier: You can draw the lines and instruct the children to do the cutting. For the hat, fold the black paper in half vertically and cut out an "L" shape. You can also choose to outline the shape and instruct the children to cut on the marked lines. Instruct the children to cut out a square from the yellow construction paper. This will be the buckle in the front of the hat. Cut 1 inch-wide strips from the cereal boxes. Staple the hat to the strip of cardboard. Review the concept of larger and smaller seeds. Begin tracking the progress of the lima bean seeds that were planted in the previous lesson on harvesting. Provide the children with rulers to measure and record the growth of a lima bean. Compare the first Thanksgiving to the way it is celebrated today. Make a list of the foods and activities that have changed as well as a list of the foods and activities that have stayed the same.